JCI - Is ghrelin a signal for the development of metabolic systems? Is ghrelin a signal for the development of metabolic systems? Citation Information: J Clin Invest. 2005;115(12):3393-3397. https://doi.org/10.1172/JCI27211. Ghrelin, produced in the stomach, acts on growth hormone secretagogue receptors (GHSRs) in hypothalamic neurons to potently increase food intake. However, male mice with deletions of ghrelin (Ghrl–/– mice) or GHSR (Ghsr–/– mice) display normal growth and regulation of food intake. Furthermore, adult Ghrl–/– mice display a normal sensitivity to high-fat diet–induced obesity. These findings from early studies raised the question as to whether the ghrelin system is an essential component for the regulation of food intake and body weight homeostasis. However, recent studies by Wortley et al. and Zigman et al. demonstrate that Ghrl–/– and Ghsr–/– mice are resistant to diet-induced obesity when fed a high-fat diet during the early post-weaning period. This commentary highlights 3 key issues raised by these 2 reports: (a) the impact of ghrelin on the development of metabolic systems; (b) the constitutive activity of GHSR; and (c) gender differences in the sensitivity to deletion of the ghrelin signaling system. Ghrelin, leptin, and gonadal steroids interact at ARH NPY/AgRP neurons to modulate food intake and energy balance. 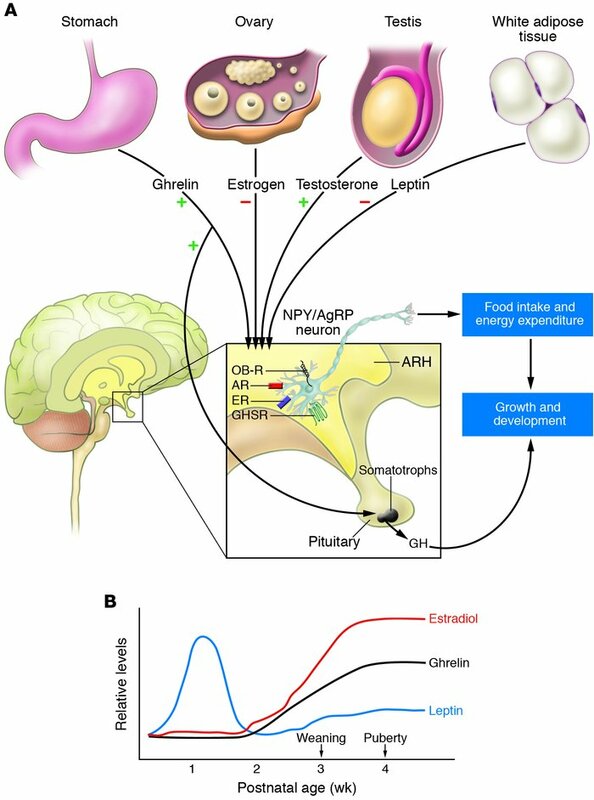 (A) Ghrelin produced in the stomach directly stimulates ARH NPY/AgRP neurons through the GHSR to increase food intake. Ghrelin can also act directly on pituitary somatotrophs to stimulate the release of GH. Leptin, produced in white adipose tissue, directly inhibits ARH NPY/AgRP through the leptin receptor (OB-R). Estrogen (released by the ovary) and testosterone (released by the testis) also have direct actions on ARH NPY/AgRP through actions on nuclear estrogen and androgen receptors (ER and AR, respectively). In females, estrogen inhibits food intake and may act together with leptin to counteract the orexigenic effects of ghrelin and promote a lean phenotype. Testosterone stimulates food intake and may act together with ghrelin to promote a more obese phenotype in males. (B) Leptin levels are very low at birth in rodents, show a surge in release toward the end of the second postnatal week, and then slowly increase to reach adult levels between weaning (around 21–23 days of age) and puberty (around 28 days of age). Ghrelin levels are also very low at birth in rodents and show a steady increase leading up to puberty.